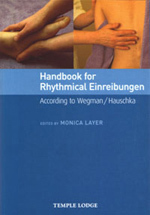 Rhythmical Einreibungen are gentle, rhythmical forms of therapeutic massage used by nurses, carers and therapists working out of anthroposophy. (The word 'Einreibung' refers to the application of an oil or ointment to the body.) The methods - developed by Dr Ita Wegman and Dr Margarethe Hauschka at the beginning of the twentieth century - were first used exclusively in medicine and nursing, but have since been applied more widely in care and nursing homes, hospitals and clinics, as well as in curative education and social therapy. • would like to learn about this effective healing discipline. 1) Describes aspects of the anthroposophical image of the human being that are relevant within the context. Concepts which are important for the application and effectiveness of Rhythmical Einreibungen are introduced and explained. 2) Distinguishes between Rhythmical Massage and Rhythmical Einreibungen. Details are given of how the rhythmical quality is created for the Einreibungen. 3) Gives a description of the techniques of the 'part' and 'organ Einreibungen' which are most important in nursing. 4) Offers specific exercises which can be used to develop the special skills required for the procedure.